Operation concept-Dar Jia Fiberglass Reinforced Plastics Co., Ltd.
Dar Jia has a design team with professional F.R.P. equipment design, structural calculation, CAD and production planning capabilities, as well as quality control/assurance units that enforce strict control over the quality and specifications of the equipment. Currently, we have 45 professional technicians, 5 of which have over two decades of experience in the field of F.R.P. and thermal plastics equipment to ensure our extraordinary technology and abundant experience. We accept domestic and overseas orders to produce F.R.P. chemical tanks, tower scrubbers, absorption towers, pipefittings and covers etc. Furthermore, we also provide services such as F.R.P. related pipefitting and equipment installation and maintenance. So far, we have already completed numerous successful projects. Starting from 1988, we engaged in the development of GLASS FLAKE LINING business and obtained the engineering technology from the Japan Company. The technology was applied to FGD and TANK lining with outstanding results. 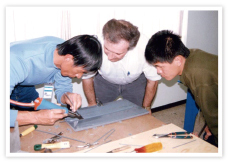 In 1990, we became Formosa Plastics Corporation’s contractor and acquired rubber lining technology from Formosa Plastics. In 1992, in order to elevate our thermal plastic technology, we purchased ARMOUR PLASTIC technology (PVC/F.R.P., C.P.V.C/F.R.P., PP/F.R.P., PVDF/F.R.P., PTFE／F.R.P.) from Canada. Thereafter, the manufacturing, installation and maintenance of thermosetting and thermal plastics were incorporated into the company’s service scope. In order to enhance academic knowhow, the company has collaborated with prominent composite material academic research institutions such as NCKU, Feng Chia University and Southern Taiwan University of Science and Technology over the years. Most of the product samples are sent to SGS Taiwan for testing to offer our clients impartial and credible quality certification.